Smoothies are the perfect blend of satisfying nutrients to fill you up when you’re working out or suffering from late-afternoon hunger pangs. But when the weather turns cold, do you really want to be sipping on an ice-cold drink? 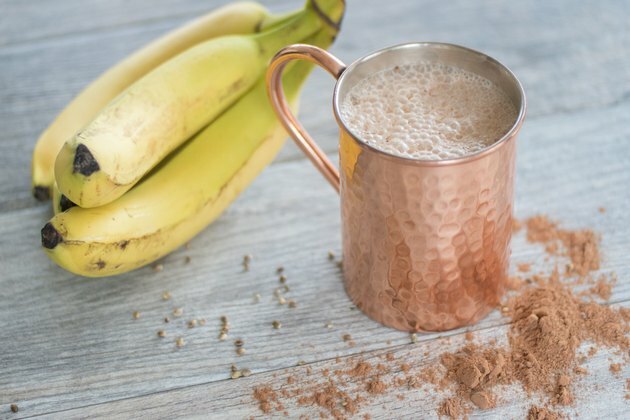 What you need is a toasty drink that’s packed with nutrients, offers all of the convenience of smoothies and, well, isn’t just fortified hot chocolate. Here are four recipes for when you want to warm up and get your smoothie fix this winter. And to accompany the recipes, we've also included tips on how to stay hydrated when it's cold out. Directions: In a saucepan over medium heat, heat milk until small bubbles form. Add banana and remaining ingredients to blender. Carefully pour milk into blender. Cover and blend on low for a few seconds, then increase speed to high until well blended. Directions: Warm almond milk over low/medium heat until small bubbles form. Whisk in cinnamon, maple syrup, vanilla extract, allspice and nutmeg. Transfer almond milk to blender. Add almond butter, applesauce and ground flaxseed. Blend on slow for a few seconds and then on high until well blended. *Note: If you don’t have these spices on hand, you can also use a mix, such as McCormick Pumpkin Spice, which will cover all but the ground cloves. Directions: Combine oats and water, then microwave. Undercook it so that it remains watery. Scoop oatmeal into blender. Add pumpkin, spices, ground flaxseed and milk. Blend on low for a few seconds and then high until well blended. Thin with additional skim milk if needed. Sweeten with a drizzle of pure maple syrup or stevia if desired. 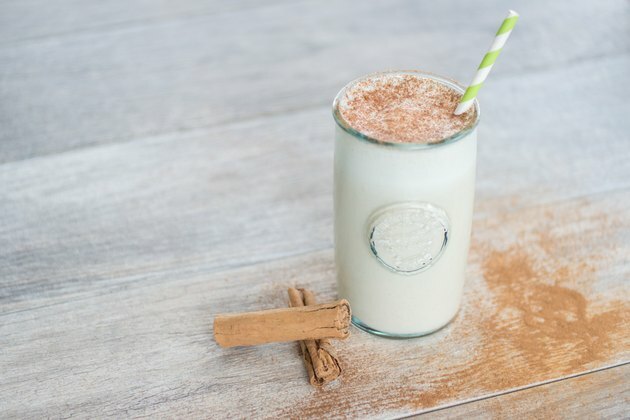 Ingredients: Cooked rice, enough unsweetened almond milk to cover rice, honey (to taste, up to 1 teaspoon), a dash of cinnamon and 2 tablespoons of Hemp Hearts. Directions: Heat cooked rice and almond milk together. Stir in honey to taste, and sprinkle with cinnamon. Transfer milk mixture to blender. Add Hemp Hearts and blend until smooth. Note: Begin blending on low and then increase to high. If necessary, blend in small batches to ensure that blender is only halfway full. Load up on veggies and sip on something satisfying when you grab a cupful of soup. Whether it’s at your desk or in the car, pureed soup is nutritious, helps you meet your daily vegetable needs and is a quick way to warm up. Look for low-sodium options on the store shelves or better yet, make your own. Aim for bright-colored soups that pack in vitamins A, C and more. Got leftover rice from dinner? A canister of oats in the pantry? These can become the base for a warm drink packed with nutrients. 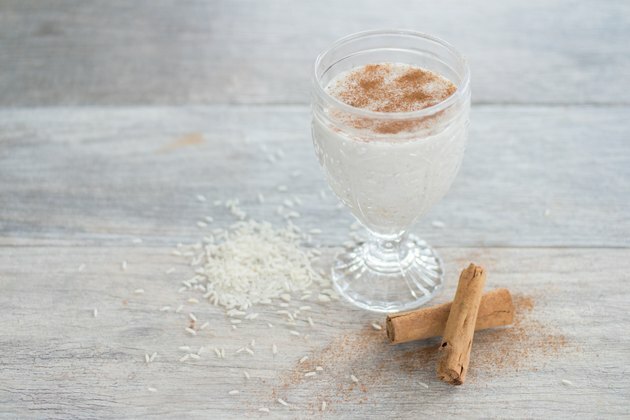 Try the Warm Cinnamon Almond Rice Drink (recipe above) that can be made with white or brown rice and works with milk or a nondairy alternative. 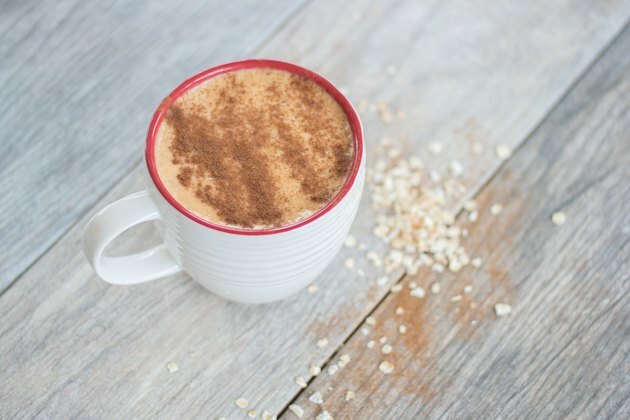 Or try warming oats in a pot or the microwave to make a Pumpkin Spice Smoothie. 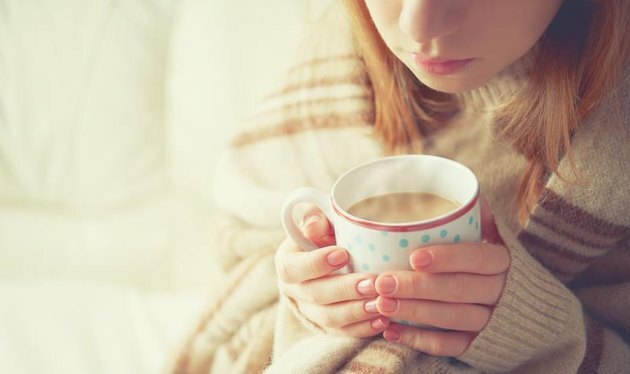 To deny yourself any warm chocolate drinks when it’s cold outside just doesn’t seem right. 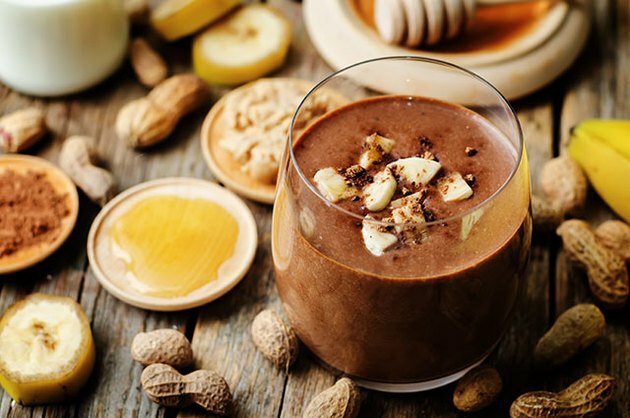 Luckily, chocolate pairs so very well with nut butter, like our Peanut Butter Banana Cocoa smoothie that tastes oh so decadent. It combines pure cocoa with peanut butter and banana to create a sweet smoothie that warms you up and satisfies your chocolate cravings. Feel free to get creative with the ingredients, such as subbing in almond butter for the peanut butter. Allison Stowell, M.S., RD, CDN, is the registered dietitian for the Guiding Stars Licensing Company, a company devoted to helping you find the good, better and best choices at the supermarket. A working mom of two, Allison enables individuals to make positive, sustainable changes in their eating habits by stressing conscious eating, improving relationships with food and offering a non-diet approach for reaching and maintaining ideal body weight. Visit her blog to read more and connect with Allison on Twitter.